In the program, written by Buz Kohan and Henry Beard (Beard had also authored the Guide to Life and the Kermitage book), Miss Piggy gets caught up in a love triangle involving George Hamilton and John Ritter. In the typical Muppet show within a show, Kermit is trying to put out fires behind the scenes of Miss Piggy’s own variety show while also dealing with feelings of jealousy. In various musical numbers choreographed by Anita Mann (who worked on the amazing numbers in The Great Muppet Caper) and with a performance by Tony Clifton (an alter ego of comedian Andy Kaufman), Miss Piggy is clearly the star. She even has a star-appropriate tantrum and walks off the set, leaving Ritter to impersonate her in the final number. 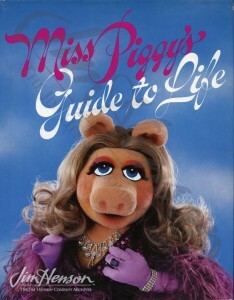 The cover of Miss Piggy’s best-selling book, 1981. Miss Piggy’s exercise program explained for listeners of her record album. 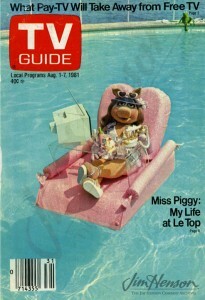 Miss Piggy on the cover of TV Guide, 1981. 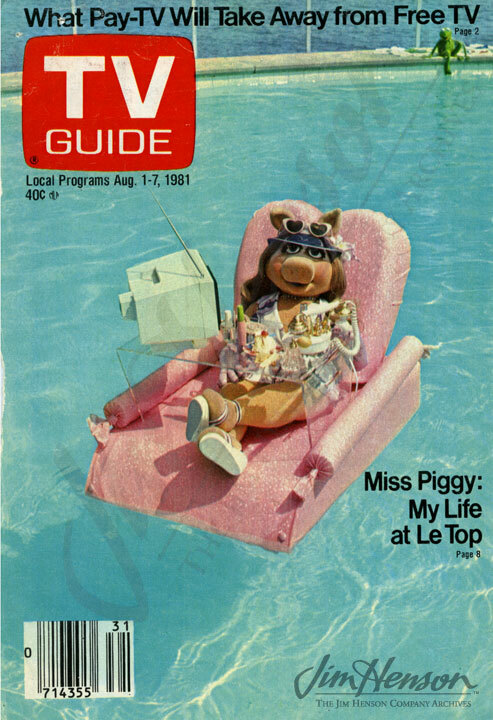 This entry was posted in 08-August '82, 1982, Muppet Specials and tagged Andy Kaufman, Anita Mann, George Hamilton, Jane Fonda, John Ritter, Miss Piggy, Miss Piggy’s Guide to Life, The Fantastic Miss Piggy Show, The Great Muppet Caper, The Kermitage Collection, Tony Clifton. Bookmark the permalink.